National statistics reveal that nearly 90% of individuals with developmental disabilities may be the victims of abuse, neglect, or exploitation at some point during their lives. Since many of these individuals are non-verbal and often have significant physical impairments, this population is particularly vulnerable to these types of crimes. The state of Florida launched the Zero Tolerance Initiative in September 2003 as a means by which to combat sexual violence committed against persons with developmental disabilities. Since that time, the Zero Tolerance Initiative has expanded to now serve as our Agency's aggressive and proactive multi-pronged approach to dealing with the national problem of all forms of abuse, neglect, and exploitation committed against individuals with developmental disabilities. The Zero Tolerance Initiative is carried out in partnership with service providers, family members, consumers, and other stakeholders within the disability community. A number of Zero Tolerance related activities and events have already taken place involving training and education efforts, monitoring and quality assurance activities, including changes to administrative rules, operating procedures, and Florida Statutes. These continuing activities are intended to prevent occurrences of abuse, neglect, and exploitation involving this vulnerable population and facilitate quicker identification and reporting of potentially harmful situations and environments when they do arise. While we have made significant progress in our prevention efforts thus far, much work remains to be done. With the input of our various stakeholder groups, a detailed action plan has therefore been developed to define and direct the activities associated with our Zero Tolerance Initiative for many years to come. 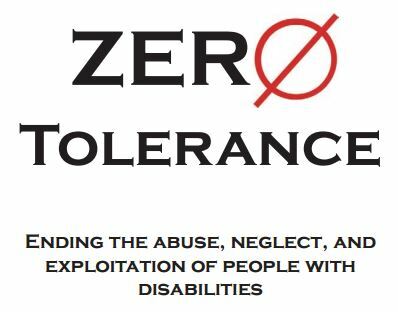 Since we recognize that in order to succeed in our efforts to protect persons with developmental disabilities from maltreatment, we ask that you take a few moments to check out the information posted here on the Zero Tolerance website. If you have questions or wish to submit comments which would help us in our efforts to combat incidences of abuse, neglect, and exploitation committed against Floridians with developmental disabilities, please send us an e-mail via our suggestion box. Also, if you happen to come across any resources or materials which might be appropriate for posting on this Internet site, please let us know. We sincerely appreciate your interest in this important issue and hope you will join us in our efforts to ensure the best possible outcomes for those individuals we are devoted to serving.